This is the 50th anniversary of the publication of a book that many urban thinkers consider the greatest ever written about cities. It’s Jane Jacobs’ “The Death and Life of Great American Cities,” and it is, indeed, an important work. Among other things, it showed us how to look at cities – particularly the interactions of street life – with greater appreciation. In 376 pages, Kretzmann and McKnight introduce us to a set of ideas as challenging to the conventional wisdom of community development as Jacobs’ critique was to city planning. Their premise: that every neighborhood and every community – even the most impoverished – is filled with human, organizational and institutional assets that should be inventoried and harnessed before seeking outside help. I’ll explain more about their ideas shortly, but first let me tell you how I was introduced to this book. In 1995, I wrote an article for Florida Trend, a business magaz ine, about a city in South Florida called Delray Beach. My assignment was to find the place in Florida with the most committed and effective group of local leaders. I found it in south Palm Beach County, which was a bit surprising because that part of the state wasn’t known as civic minded. But a much greater surprise came when I got to Delray Beach. Leadership worked in Delray, I learned, in ways differently than any place I’d ever visited. By the time I visited RLA, Ueberroth was gone and so was the 30-member board. In their place was a quiet, confident Latina named Linda Griego who had been asked to clean up the mess at Rebuild L.A. and do something to improve the area. Griego wasn’t interested in high-profile fund-raisers or big-ego politics. She renamed the organization and focused on the community’s strengths. What she discovered as her organization inventoried South-Central block by block was that there was a lot more to the area than outsiders thought. She found dozens of promising but underserved retail locations and hundreds of small employers. Maybe the greatest surprise: South-Central was a honeycomb of small manufacturers, from print shops to metal-working establishments. Griego organized these small businesses so they could support one another and negotiate with big businesses and city hall. And she produced corporate-style market studies, pinpointing places that a drug store, supermarket or discount retailer could thrive. She took these studies to chain stores that had never given places like South-Central L.A. a second thought and already had successes to show for her work. What’s needed for change – for altering the fate of neighborhoods and the lives of people and not just easing their pain – is a new way of thinking about these communities, not as a collection of needs but as a wealth of assets that haven’t yet been identified, organized and made productive. What assets? They are “the capacities, skills and assets” of the residents and the neighborhood itself. And you find these assets in three forms, Kretzmann and McKnight say: in individuals, associations (formal and informal groups of various kinds) and institutions (from churches, businesses and schools to police stations and neighborhood parks). 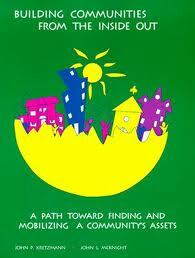 Most of the book is given over to showing how to find these assets and what to do with them once they’re found.
. . . All the historic evidence indicates that significant community development takes place only when local community people are committed to investing themselves and their resources in the effort. This observation explains why communities are never built from the top down or from the outside in.
. . . Outside resources will be much more effectively used if the local community is itself fully mobilized and invested, and if it can define the agendas for which additional resources must be obtained. OK, this isn’t great writing. In fact, at one point Kretzmann and McKnight caution that their book “is not a novel.” It’s meant to be read as a handbook, skipping from section to section as needed. But for community developers or others who care about cities, there’s as much wisdom here about the human assets of cities as you’ll find in Jane Jacobs’ descriptions of the physical assets. There’s one more thing: The greatest obstacle to effective action in cities is the complexity of communities. People are frozen because they don’t know where to start. “Building Communities from the Inside Out” tells us not only how to make sense of places but where to begin our efforts to improve them. Literally. One of its final chapters outlines a five-step process: Map the assets, build relationships, mobilize for economic development and information sharing, convene the community to develop a vision and plan, and (only then) seek outside help. 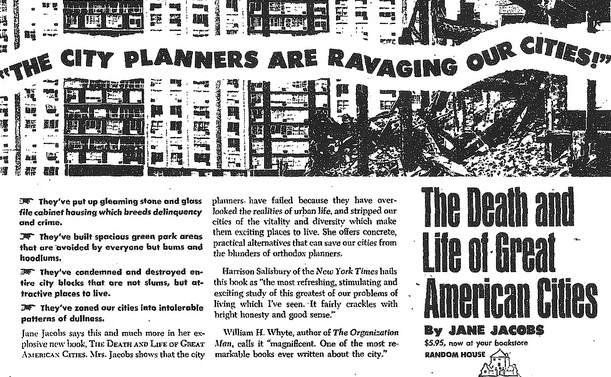 If you want inspiring prose and a dead-on analysis of the physical assets and street life of cities, turn to Jane Jacobs, who probably did write the greatest book ever about cities. But if your tasks involve changing attitudes, peeling back layers of cynicism and apathy, and rallying groups to improve the places they live, then Kretzmann and McKnight have written the book for you. And by anyone’s measure, it’s a great one. Photo of Jane Jacobs book ad by Pdxcityscape licensed under Creative Commons. Asset based communities is the proper term these communities hold a wealth of talent it just needs the right people to empower them religion politics and the like must be left and empathy common sense and realism be the foundation real people will respond to real people.